Kearui plant watering spike is an easy and green tool to grow your plants in a healthier way by delivering the right amount of water. The clay stake is porous. When you put the bottle full of water in the stake, it takes some while for the water to soak through the porous clay. This is to keep the soil continuously perfectly moist so you water will not gonna be under or over watering. It's easy to install and be holding up for almost 2 weeks. You can feel free traveling or going for a business trip. Rest assure your lovely plants because Kearui automatic watering system is taking very good care of them in a very effectively and natural way. 1.Before use soaks the spike in water to treat the Terracotta and open its pores. 2.Get a long neck bottle (wine bottle prefers) and make sure the bottle is clean. 3.Fill the bottle water; the amount of water is supposed to be depending on how long you will be gone. 4.Place the watering stake on the top of the now filled bottle.Turn the bottle over carefully with the stake firmly on the top. 5.Push the stake and bottle into the guide hole carefully till it's almost completely in the soil. Please be careful not to squeeze too much, but keep the bottle opening covered so it doesn't overflow. 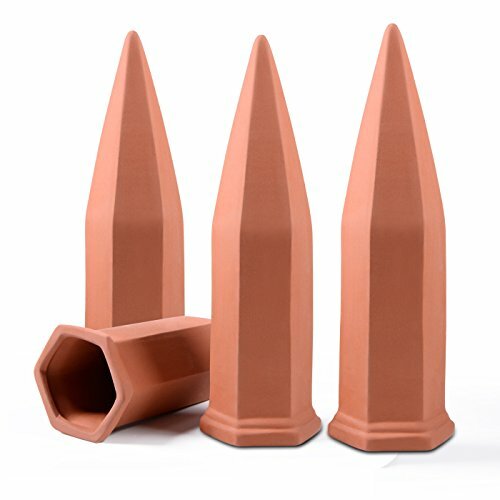 NO MORE SHATTERD - Well baked terracotta; good shape with great durability and water permeability. GREEN AND ENVIRONMENTAL - Recycling used long neck bottles and use them to water both outdoor and indoor potted plants for you. AUTO DRIP IRRIGATION - Easily hold up for couple weeks so you can travel more pleasantly and worry less about your plants. NO MORE OVER OR UNDER WATERING - Water seeps through the clay when ground gets drier so as to keep a balance of moisture; grow healthier plants. SIMPLY SET AND GO - You basically fill a bottle, insert it in this, and insert this in the pot; Then Mother Nature takes over; It's just that simple. If you have any questions about this product by Kearui, contact us by completing and submitting the form below. If you are looking for a specif part number, please include it with your message.